Manchester City capitalised on a lacklustre run of results on Liverpool’s part with a 2-0 win over Everton on Wednesday night as they regained their seat at the top of the table, having surmounted the Reds’ 10-point advantage. Back-to-back draws with Leicester and West Ham compounded Jurgen Klopp’s misery after the Merseyside outfit dropped seven points from their last five to allowed their title-rivals to catch up, despite the Etihad Stadium outfit suffering a loss to Newcastle last week. They have bounced back, though, with victories over Arsenal and now the Toffees. As many have done before them, Marco Silva’s men set up to frustrate the champions and it worked for the best part of the game, with the home side matching City in the opening stages. Eventually, though, the visitors’ quality proved to be too much for their opposition once again and Everton’s vulnerability from set-pieces was exploited. With Sergio Aguero and co uncharacteristically struggling to find a breakthrough – the Argentine nearly found the corner with his improvised, acrobatic effort in the second half, though – Aymeric Laporte looked certain to nod his side ahead in the first half but he fired Ilkay Gundogan’s deep corner wide. The Frenchman redeemed himself with the last kick of the ball in the first half, though, breaking Everton hearts as he leaped to meet David Silva’s free-kick to head beyond a hapless Jordan Pickford to make City’s possession count for something. While his strike may have been a typical defender’s goal – a towering header – there was little else ugly about the centre-back’s game as he filled in at left-back for the injured Benjamin Mendy. Taking 95 touches – a match-high as per WhoScored – the former Sevilla man was central to a lot of his side’s possession play and attacking, contrary to his position. Pep Guardiola likes each and every one of his players to be able to score – last season we saw Nicolas Otamendi stride forward from the heart of defence to get on the end of a cutback on many occasion – and Laporte is no exception. His goal was his fourth of the season in all competitions, but don’t let his crucial opener at Goodison Park distract you from the excellent defensive work he did. The 24-year-old completed a joint-team-high – Kyle Walker matched him – 4 tackles, offering Everton nothing when they looked to break forward having soaked up City pressure. 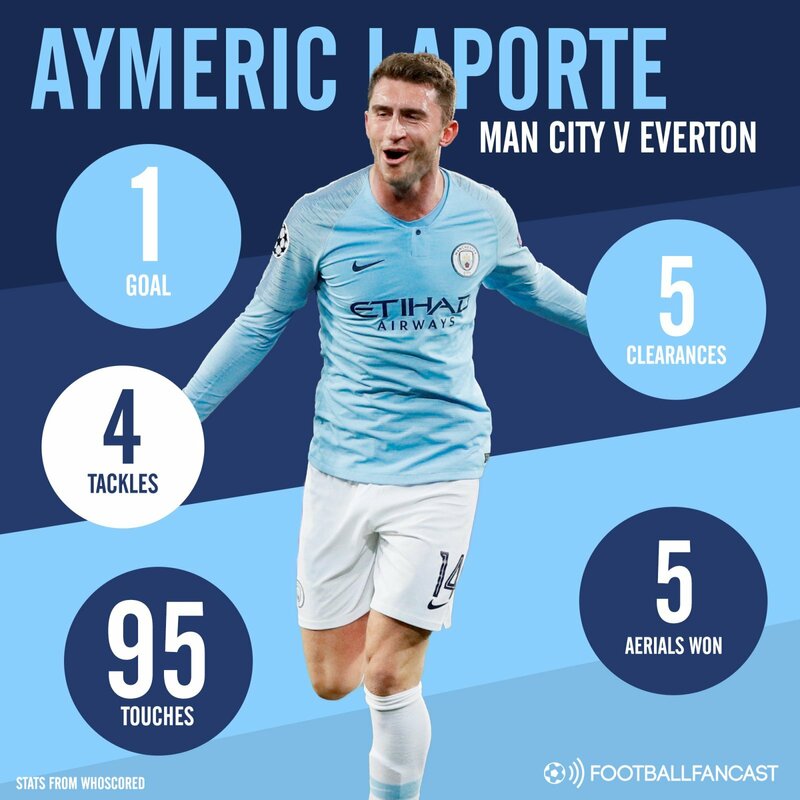 Using his height to dominate in the air when the Toffees look to bypass the brilliant City midfield, Laporte won 5 aerial duels and completed 5 clearances – even City have to get rid of the ball sometimes. Wednesday’s win over Marco Silva’s side saw City overtake Liverpool on goal difference, although the Reds will have the opportunity to regain the advantage against Bournemouth on Saturday. Meanwhile City host Chelsea – who inflicted the champions’ first defeat of the season in December – at the Etihad Stadium, and Laporte will be looking to improve on the shoddy performance he produced last time the two sides met. The versatile defender played at centre-back then but it would be hard for Guardiola to shift him inside after his excellent showing on Wednesday. Based on current form, there is no way Willian will find a way past the City number 14 on Sunday.